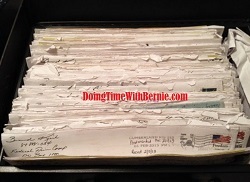 DoingTimeWithBernie.com: Affluenza Alert: Felon Bernard Kerik owes the United States $180,000 in criminal restitution yet still owns $180,000 property in Florida? Affluenza Alert: Felon Bernard Kerik owes the United States $180,000 in criminal restitution yet still owns $180,000 property in Florida? Affluenza Alert: Felon Bernard Kerik owes the United States $180,000 in criminal restitution yet still owns $180,000 property in Florida? Yup. Felon on alleged "supervised release", former NYPD Commissioner, Bernard Kerik, according to current property records in Pasco County Florida, still owns and pays taxes on THREE parcels of property he and his doormat wife, Hala Kerik, purchased in 2005. 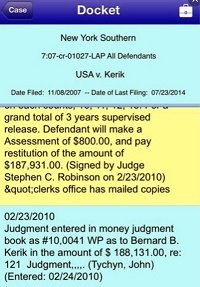 Source: Pasco County FL property records Affluenza Alert: Felon Bernard Kerik owes the United States $180,000 in criminal restitution yet still owns $180,000 property in Florida? Taxpayers may wonder why the United States Probation Authorities have not compelled Bernie Kerik to liquidate these properties. In a coincidence, the total assessed values of the properties appear enough to cover the outstanding restitution. Credit SDNY USA V Bernard Kerik Affluenza Alert: Felon Bernard Kerik owes the United States $180,000 in criminal restitution yet still owns $180,000 property in Florida? 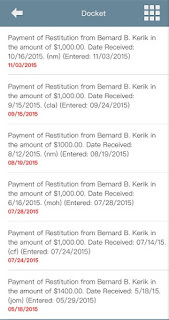 To add insult to injury, US Taxpayers may also wonder why felon on probation, Bernard Kerik, is showing to NOT HAVE MADE THE LAST TWO MONTHLY INSTALLMENT PAYMENTS of $1000.00 toward the huge UNPAID debt to society! Source SDNY USA V Bernard Kerik Affluenza Alert: Felon Bernard Kerik owes the United States $180,000 in criminal restitution yet still owns $180,000 property in Florida? All the time Bernard Kerik, his doormat wife, Hala Kerik and two spoiled children (Angelina Kerik and Celine Kerik) live in luxury on a $2 million estate in Franklin Lakes, New Jersey, next door to "Real" Housewife of New Jersey, Caroline Manzo and in company of another felon and "Real" Housewife of New Jersey, another felon on supervised released Teresa Giudice (who is also currently on federal supervised release arriving home to make her "Criminal Justice Reform" fortune). If taxpayers wish to know why these CRIMINAL RESTITUTION obligations imposed upon these "special" former inmates and felons are literally ignored, you may begin by contacting the US Department of Probation. Felon Bernard Kerik's probation officer is reported as P.O. Luis Gonzalez Office: 973-357-4080 or 973-223-0593. Don't hold your breath. We've heard Gonzalez may have "soft spot" for Kerik as they are both "Jersey guys in blue". Allegedly, of course. 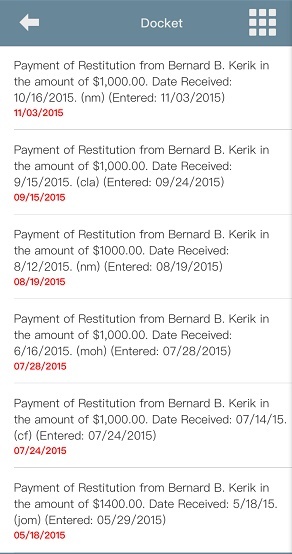 Source US Probation Office Affluenza Alert: Felon Bernard Kerik owes the United States $180,000 in criminal restitution yet still owns $180,000 property in Florida? Or you can contact felon Bernard Kerik's headline grabbing, and sometimes fledgling, unscrupulous pro bono attorney and man crush, Timothy (Payne) Parlatore, who FisherBroyles LLP foolishly hired, who may have an excuse or two to add to the mix. 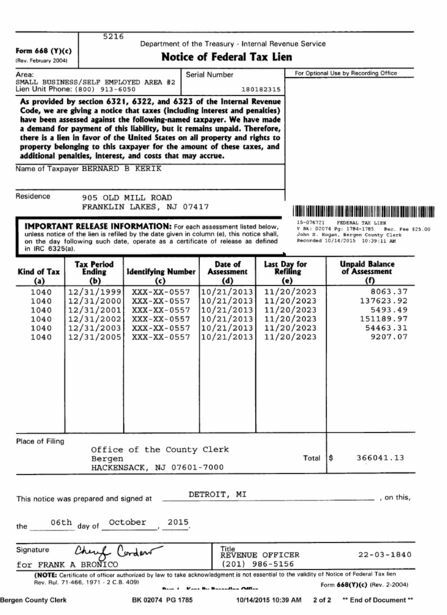 Source FisherBroyles LLP public website Affluenza Alert: Felon Bernard Kerik owes the United States $180,000 in criminal restitution yet still owns $180,000 property in Florida? 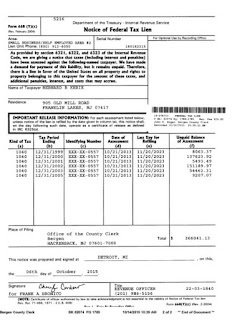 Of course, there's the United States Department of the Treasury whopping $366041.13 tax lien that is still picking poor Bernie's pocket for the TAXES he still has yet to pay. Source Bergen County NJ Tax Search Affluenza Alert: Felon Bernard Kerik owes the United States $180,000 in criminal restitution yet still owns $180,000 property in Florida? Yes, felon Bernard Kerik has many legal challenges in the Southern District of New York currently including that pesky litigation from "From Jailer to Jailed" as well as the Tacopina v Bernard Kerik defamation suit.